Can you believe that we are almost at the end of the Blooming Wallflowers quilt along? But not to worry, I have more inspiration coming your way! Next week we will bind our quilts to finish. But in the meantime, check out the fabulous quilts being made and shared in my Facebook group. Everyone featured today wins a free PDF pattern of their choice for sharing! I love how Gina S. Chose soft watery batiks for her version and paired it with a black background. She finished it off with a textural allover quilting design and that binding is to die for!! Lynn L. gets bonus points for practicing her free motion quilting on a test piece before diving into her quilt. This is one of the recommendations I make in all of my classes. Above is Lynn’s fun pieced quilt backing, made from yardage of Modern Marks Navy Herringbone plus Abstract Garden leftovers. I love it!! Laina L. is following the quilting plan as shown in the Blooming Wallflowers quilt pattern. Isn’t she doing a fantastic job on her pebble quilting?? I don’t know about you, but seeing everyone’s progress inspires me to want to quilt today!!! Click here to purchase the optional kit while supplies last. Click here to share your progress in my ChristaQuilts Facebook group. Click here to receive quilt along updates via email. Click here for the supply list and links to previous quilt along posts. I’m adding in another “catch-up” break so that those of you following along will have plenty of time to work on your quilts. But just remember, you can work on Blooming Wallflowers on your own schedule, too! Scroll to the end for links to all of the previous QAL posts. Of course I had to match my shoes to my quilt!! 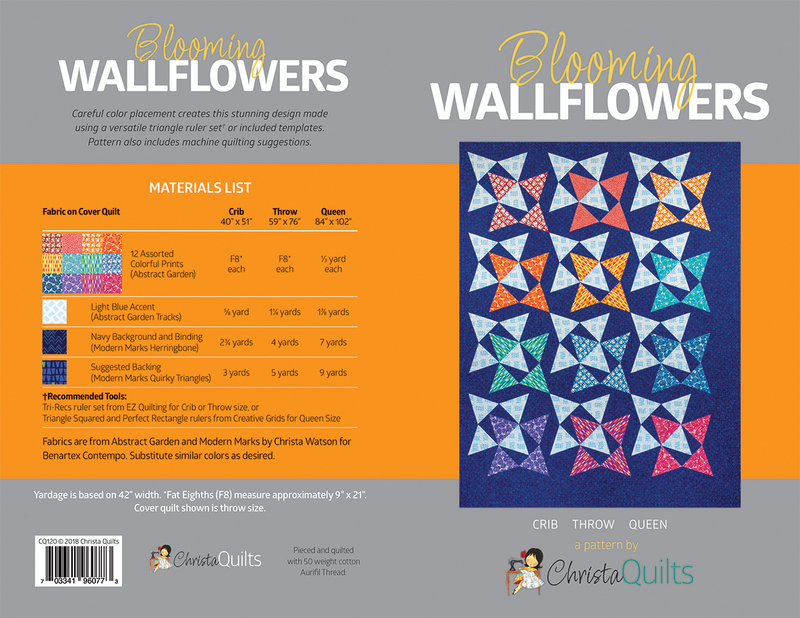 Click here to get a Blooming Wallflowers kit (while supplies last). It was exciting for me to see Blooming Wallflowers hanging in the show at QuiltCon last week! The biggest comment I got was how much nicer it looked in person (probably due to my inadequate photography skills, LOL!) and how much everyone loves the Navy Herringbone background from Modern Marks. Now it’s your turn to show off what ya got so far! Take a look below at these fabulous works in progress being shared on Instagram #bloomingwallflowersquilt and in my Christa Quilts Facebook group. Then be sure to share your progress, too! Sandra C aka @thebiasedge on Instragram shared her gorgeous quilt top that she’s getting ready to load on her long-arm. I can’t wait to see her quilting in progress! I love how Michelle H made hers bigger by adding more blocks. Her print fabrics are fantastic! Robin P (aka Palm Beach Quilter) chose a light green background for her version. She made the baby size which is the exact same layout, except the blocks are smaller! I’ve included 3 different sizes in the quilt pattern so you can customize it to fit your needs. Who says you have to use a dark background? Gayle S is creating a stunning version with white background and a fun polka dot accent fabric. Isn’t it so fun?? Next week I’ll start sharing tips for fun and interesting machine quilting – I can’t wait! I’m the Guest Curator For February’s Quilty Box! I have some super fun and exciting news to share: I’ll be the guest curator for February’s Quilty Box. And even better news: click here to get $10 off your first Quilty Box subscription! Here’s the way this fun subscription service works: choose a 1 month, 3 month, 6 month or one year subscription and received a fabulous box of quilt goodies curated by some of your favorite designers. They usually include fabrics, a brand-new pattern, and several awesome notions, all for an amazing lower price over what you would pay for them separately. And the more months you sign up for, the better the deal gets! Click here to get $10 off your first subscription of QuiltyBox. Each monthly box is like getting a fun surprise in the mail, so be sure to up by Feb 9th! It will ship approximately February 11, and as a special bonus for subscribers of my box, I’ll be offering an exclusive quilt along in March with a brand new pattern that will be revealed in the February box. I can’t wait for you to see it! and I can’t wait for the big reveal, coming soon!!! This week it’s time to start sewing our blocks from the pieces we cut out last week. (Be sure to scroll to the end for all of the pertinent QAL links.) And don’t worry if you haven’t started yet; next week will be a catch-up week so you won’t get too far behind! The triangle in the middle is called an isosceles triangle which has two sides that are the same length. Many people confuse this with an equilateral triangle because it looks similar, but it’s not. So take care to ensure the triangle is in the correct orientation when sewing it together. Just remember to keep the blunt edge at the top of the block and you’ll be fine. The triangles on the sides are called “scalene right triangles” because none of the sides are the same length and it has a 90 degree angle. The triangles are similar to each other except that one is a “left-facing” triangle and the other is a “right-facing” triangle. For ease of reference, I refer to them as triangle pairs in the pattern since you need both to complete each block. Please bear with me as I’m still learning how to do videos on my own. So for now, they won’t have sound. As I add videos to the QAL, hopefully they’ll get better each week. Think of it this way: I’m doing this Quilt-Along for YOU, but it’s a YouTube-Learning-Along for ME, LOL!! (1) Notice that the middle triangle has the blunted edge at the top and the two half rectangles have the blunted edge at the bottom. The most common mistake people make is switching the placement of the triangles so be careful not to do that. (2) Once the placement looks good, pin the units and sew them right sides together. If you are sewing multiple blocks, be sure and chain piece (assembly line sew) all the lefts, then all the rights, etc. I always recommend sewing with a smaller stitch length and pressing the seams open for flatter blocks. (3) When your blocks are sewn correctly, the top triangle tip will be floating 1/4″ from the the top (for seam allowances) and the bottom triangle tips will go all the way to the edges. Don’t forget to trim off the little dog ears (excess triangles) sticking out beyond the edge of the blocks! Above is a 20 second video snippet showing how I quickly cut apart my chain pieced units using of of my favorite notions: the Triangle Thread cutter from SunflowerQuilts. Half of the blocks will be made with the light blue centers while the other half will be made from the assorted colorful prints. See page 7 of the pattern for details. So remember, you’ll have 2 weeks to finish up your blocks. Next week I’ll share a few inspiration images showing the different block combinations that you all are making. Everyone who gets featured will get a free PDF pattern of their choice, so be sure to share your progress in my Facebook group, or on Instagram using the hashtag #bloomingwallflowersquilt. Click here for the supply list and schedule. Are you ready to dive in and make this dynamic looking quilt? All you need is a copy of the Blooming Wallflowers quilt pattern and you can jump in anytime! See the end of this post for all relevant links. The triangles used in this pattern are a specific shape and require either the use of the full-size templates included in the pattern, or a specialty ruler. Tri recs is recommended for the smaller sizes or Creative Grids Triangle Squared AND Perfect Rectangle for the larger size. Of course you can use the larger rulers for the smaller blocks, too. These are all of the cut pieces used to make Blooming Wallflowers. Stack and layer the fabric strips for faster cutting. Follow the chart on page 6 of the pattern to cut the center triangles from the colorful prints. Here’s a quick 1 minute video demo showing how I used the specialty ruler. Notice the position of the blunt end on the ruler. Corresponding diagrams can be found on page 2 of the quilt pattern. The background triangle pairs s are cut in the same way except you will want to make sure to cut one left and right triangle at the same time. The easiest way to do that is to make sure the background fabric strips are folded in half. Then you’ll get one pair per cut. See the step by step cutting diagrams on page 3 of the pattern. Here’s another short video showing how I cut the triangle pairs. Don’t forget to trim off the little triangle tip at the top to ensure proper matching when sewing them together next week. I used the ruler to trim off the left edge of the fabric strip first, and didn’t worry about the direction of the print while cutting. The background fabric is Navy Herringbone from my Modern Marks fabric line. The rest of the background is pretty straightforward. Follow the chart in the pattern on page 6 to cut extra background squares that allow the design to float, plus the side and corner triangles and the binding strips. See the diagram on page 3 to cut the corner and side triangles. I love a pretty stack of cut pieces, don’t you? Once everything is cut, you’ll be ready to sew the blocks together next week! Don’t forget to share pics of your progress in my Facebook group, or on Instagram using the hashtag #bloomingwallflowersquilt. Can I say how much I enjoy doing quilt alongs with you all? It keeps me motivated to design and make new things, and nothing thrills me more than seeing all the variety of quilts that are being made, even when we all start with the same basic pattern. So I’m excited to announce the next quilt along which will start mid January! We will be making my Blooming Wallflowers quilt from start to finish over 12 weeks. Each Friday starting in Janaury, I’ll share a new blog post with inspiration pictures, bonus tips and plenty of cheerleading to keep you motivated. I’ve built in a couple of breaks to the quilt along, so it should be a nice and relaxing pace, and easy to follow along! Of course, you can use whichever fabrics you like, but I’ve put together an optional fabric kit which includes all the fabric to make the quilt top and binding as shown above: Fat Eights of 12 different Blooming Roses prints, 1 1/4 yards of light blue Tracks for the accent, and 4 yards of Modern Marks Herringbone Navy for background and binding. It’s completely free to follow along and you will gain tips and tricks for better quilt making, even if you don’t want to actually make the quilt! Click here to sign up and be notified each time a new quilt along step has been released. I’ll post the complete supply list and schedule on January 4th and will then give everyone a couple of weeks to gather their materials and supplies before we dive into cutting on January 18th. We will wrap up by the end of March and I’ll encourage everyone to post their progress in my ChristaQuilts Facebook group. After all, doing things with friends is a large part of the fun! So who wants to join me?? Leave a comment if you plan to follow along, either making the quilt – or virtually in your head!! Although my Dot ‘n Dash quilt along wrapped up about a month ago, I wanted to revisit it one final time to share all the links to all the posts for anyone just wanting to get started. I also want to share some gorgeous photos from several in my Facebook Group that made their versions. Click here to purchase the Dot ‘n Dash quilt kit, while supplies last. As a reminder, the pattern for Dot’n’Dash can be found in my book, Piece and Quilt with Precuts and it’s easy enough to gather your supplies: just one Jelly Roll of prints and 3 yards of background fabric are all you need to make this fun quilt. Here are some beautiful finishes and works in progress from others who are making their own versions. Some of them have finished while others are still working at their own pace, so it’s never too late to jump in and start! Don’t you love this one above in teal by Lucy Given? She did a fabulous job making it super scrappy by mixing up beautiful blue hues for both the blocks and the background. She’s finished the quilt top so far and I can’t wait to see how she quilts it! Here’s another beauty above, pieced and quilted by Patti Baymiller. Didn’t she do a fantastic job on the quilting? The texture is so fantastic! I love it when others show how easy and fun domestic machine quilting can be. How about this one done in Halloween novelty prints by Heather Lofstrom? She quilted it with a diagonal grid and she shares more of her inspiring quilty life over on her instagram account @aquiltingcowgirl so be sure to check out her feed for more fun! Of course I might be biased, but I really think Lucy Blum’s quilt top done in Modern Marks looks just as fabulous!! She used up leftovers from other projects, and although the Modern Marks precut strips are sold out, you can still grab a fat quarter bundle and cut your own strips if you are so inclined. Lisa Tucker created her stunning quilt with a yellow background which really pops! Who says you have to use a neutral background, right?? Here’s another quilt in process, being quilted by Abbie Bill. She’s opting for the original quilting plan as given in the book and she’s making fabulous progress!! Here’s a roundup of links to all of the Dot ‘n’ Dash Quilt Along Posts that were shared. Keep in touch and let me know if you have any questions as you make YOUR version – I’d love to cheer you on! Quilting Detail from Dot’n’Dash made from my Fandangle Strip-pie. I can’t believe we’ve finally come to the end of the Beaded Lanterns Quilt Along! If you’ve missed any part of it or want to make one later on, be sure and check out the rest of the links at the end of this post. Over on the BERNINA blog at We All Sew, I’m sharing my method for binding my quilts. If you’ve followed any of my quilt alongs before it will look familiar because it’s the same technique I use for all my quilts large or small. One thing I will say is that the more you do it, the faster and better you’ll get! This week we are getting down to the nitty gritty and getting the quilt ready for machine quilting next week. But don’t worry, if you aren’t to that point yet, that’s perfectly fine. These quilt along posts will stay up indefinitely and you can always refer back to the intro post for links to each specific QAL step. Click here for the quilt along schedule and supply list. Getting ready to machine quilt is a little like getting ready to paint a house. The actual painting isn’t hard – it’s all the prep work (ike moving furniture and taping down the windows) that takes time and gets in the way of the fun part. So take your time to prepare the quilt and baste it and don’t feel like you have to rush this part. In fact, I always set aside a separate day for backing and basting and then give myself a little reward when my least favorite part of the process is finished! A tip on choosing batting: if you want to hide machine quilting “irregularities” and give your quilt that antique puckered look, choose a cotton batting. If you want to give your stitches more definition and a loftier look, choose wool. I usually stay away from polyester batting because it’s very slippery and usually causes me to get puckers on the back of my quilt. Cotton and wool cling to the quilt which gives you better control while quilting. You want to ensure that the backing fabric is at least 3-4″ bigger on all sides of the quilt top, more if you plan to long arm quilt. The easiest way to do this is to cut two large pieces of fabric and sew them together. For example, my quilt measures 60 x 72. So If I cut 4 yards into 2 two -yard pieces that will give me one big rectangle approximately 72″ x 80″ to work with once the chunks are sewn together parallel to the selvage. I basted this quilt at a recent teaching retreat I participated in. All you need is one table for basting – work on the middle and then the sides as needed. If you prefer to pin baste, click here for an alternate tutorial. My basic method for spray basting is to spray the wrong side of the top and bottom layers of the quilt outside, then bring them inside for assembly. For a slight variation of this technique, click here for my wall basting tutorial. My favorite basting spray is 505. Be sure to shake the can before you use it and spray a little on a scrap to make sure the nozzle isn’t clogged. If the spray doesn’t flow out evenly, some of the chemical can accumulate and leave a stain on your quilt, so always test it first. At first I tried an off brand that a friend had but I didn’t like it because it wasn’t sticky enough. Fortunately one of the other retreaters had some 505 which they let me use for my quilt! The basting spray does not cause any problems with machine quilting, and if you notice it starting to gum up the needle at all, just wipe it away and you’ll be all set! Lay out all 3 layers of the quilt – backing, batting, and quilt top on a large table (or design wall). Spend time smoothing out each layer with a long acrylic ruler before adding the next layer. This can take awhile but is worth it so that the quilt is nice, flat and smooth. Notice the leftover batting – most of it will get trimmed away after basting. I like enough extra batting and backing so that I don’t have to worry about getting my quilt top perfectly centered. You can also use the acrylic ruler to scooch any quilt blocks back into place and straighten out any wonky seams as needed. Smooth out any bubbles as needed so that the quilt is nice and flat. The last step is to iron the quilts on both sides – front and back. This helps set the glue and allows you to work out any wrinkles one last time before you quilt. I use a hot dry iron ,with no steam. You can iron the quilt on an ironing board, or on a table to give you more room. Because there’s batting inside, the quilt acts as it’s own pressing surface. My quilt is basted and ready to quilt! Now it’s your turn! Get your quilt basted and we’ll start machine quilting next week. We’ll have extra time for quilting since it’s my favorite part! (3) Share a link to your blog, or leave a comment about your process on this post. Trim the batting so that there’s only 1-2 inches sticking out on all sides of the quilt. This will prevent the excess from flipping under the quilt and getting caught in the machine.